" I touch the future. I teach." Lady Deuces basketball... Confident young Women first. Athletes second. Winning third. One of my golden rules for my teams is that COMMUNICATION ELIMINATES CONFUSION. Having said that, I often try to put everything but the kitchen sink into my letters so that there are no questions left unanswered. My coaching philosophy is no exception. I've never been much into gardening. Yet over the years I find great pleasure in planting "daffodils" through "teaching basketball" and inspiring the positive development of future generations of young women. For years over 10 years now I've been coaching or "teaching" girls basketball. While it's frustrating at times I love the opportunity of working with a new group of young ladies. When you plant those seeds, much like with a garden, you nurture, care and water the young seedlings, hoping for the best, but never quite sure if your efforts will pan out. I once read that a teacher "affects eternity; he can never tell where his influence stops." Although my presence in their lives is for a mere instant, it is my hope that I strike a bond with and make an impression on my players that lasts a lifetime. I coach basketball because of a love for the kids I work with and I love the game. I got into girls basketball because there was a need; I have stayed because I prefer the women's game and coaching girls. 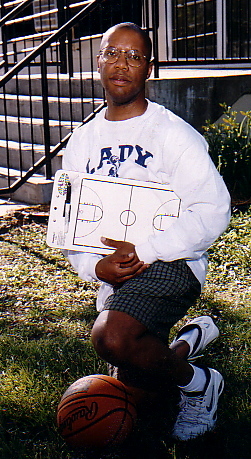 I began with boys basketball but switched to girls because of a dearth of coaches on that side. It's been a move that has been most rewarding and one I have no regrets about. In the words of UCLA coaching legend John Wooden, "For the beauty and the finesse of the game, women play better than the men. They play below the rim. They pass better than men. They shoot free throws better than the men. I'd rather see a good women's basketball team play than see these prima donnas all the time." I am a stern taskmaster but I have a sincere love for all of my players. I understand that I am a role model and that I have a captive audience in the young ladies that I coach. I am aware that my players will observe the way that I carry myself and how I handle success as well as adversity. I take very seriously my role as a coach and a role model. As such, the goal of Lady Deuces basketball is and will always remain to not only field a competitive team, but to also provide an opportunity for young girls to develop and improve their skills against high caliber competition, receive maximum court time and prepare them to play at the next level. Personal skill development, unselfish play, and having a fun and positive experience are priorities of this team. In addition to developing and improving players' basketball skills, it is our vision to use basketball to teach life lessons and develop self-esteem, character, teamwork and sportsmanship. The game of basketball is much different now than it was when many of us competed. The players who make the teams now are those who are involved in the summer camps and the traveling teams. They are able to improve their skills because they consistently play against the best competition. Unfortunately, cost is prohibitive for many youngsters. It is our goal to offer an alternative to those who are serious about their basketball, however cannot afford to play on a traveling team or attend basketball camps. The Lady Deuces offer no tryouts. Any female in the age groups of our teams is welcome to play REGARDLESS OF PLAYING ABILITY. I am not the most knowledgeable coach in regards to the X's and O's of the game, but I am a student of the game. I think I have a knack for molding a group of individuals into a well-disciplined team. I often spend my free time watching basketball or studying coaching manuals and playbooks. I ask my players to strive for improvement each day and expect no less from myself. I want at all times to be prepared and to place us in the best possible position to win each ball game. However, my mission isn't JUST to win a game. I have 7 children — ironically, 6 boys — so my players are the surrogates for my lack of daughters. And that is not idle talk. I TRULY look at each of my players as a daughter. As such I want to contribute in anyway possible in preparing my "daughters" for life after sports. In the words of soccer great, Mia Hamm, "Sports can do so much. They've given me a framework: Meeting new people, confidence, self-esteem, discipline, and motivations. All these things I've learned, whether I knew I was learning them or not, through sports." Perhaps the most important trait you will discover about my teams is that we are "FAMILY." I try to model my teams after the North Carolina men's basketball team and the "FAMILY" atmosphere surrounding that program. You hear a lot about the "North Carolina basketball " FAMILY" and that "FAMILY" type of closeness and loyalty is what I try to instill into my players. No matter when you played for me, you are always a part of this basketball "FAMILY." (Do you get the idea of how important "FAMILY" is to this basketball team?) I can pretty much name every player that has come through my program and I continue to monitor their development as young adults — athletic, scholastic and extra curricular activities — long after they play for me. I often use former players to assist me in coaching, planting a seed in their mind to remember to give back to others what they have gotten out of the sport. Bottom line is, our association does not end at the conclusion of our season. The Manhattan Lady Deuces began as just a team comprised of 7th and 8th graders but expanded into the 9th/10th grade division because the seventh and eighth graders from that first season are now 9th and 10th graders and no longer eligible to play in that age group. Yet they still have a desire to play for me. To me, that is a testament of the sense of "FAMILY" I have tried to instill and I simply could not deny that request. I cannot and will not make any predictions on the season. The only thing I can guarantee is that we will work hard to develop and improve your daughter's individual and team basketball skills. I hope to make this a basketball experience that both you and your daughter can take pride in. Past experience has taught us that it usually takes at least a year before a new team gels. As such, though it is never easy, we expect a long and difficult season. However, we do not base success on wins and losses, rather the improvement of our players over the course of the season. As I previously stated, my mission isn't just to win games. Although the tournaments we are scheduled to play in are more competitive than Parks and Recreation basketball, I do not measure success by wins or losses. My priorities for each of my teams are for the girls to have fun, to learn and develop as players. If we accomplish that but lose every game, I will be content. Please don't get me wrong — I am fiercely competitive and hate losing with a passion — but that competitiveness takes a backseat to my objectives. One of the first principles I attempt to instill in my teams is the cliché: There is no 'I' or 'Me' in 'Team.' I do not coddle superstars. Every player in my system has a specific role. No role is more important than any other. Without all players working as one team, we are doomed to fail. I DO NOT CODDLE SUPERSTARS. Having said that, the point guard on my team is the most demanding and challenging position. This player must be an extension of myself on the court and is basically allowed to run plays and set formations on their own. Because of this responsibility, I probably have a closer relationship with my point guards, but the flipside is that I am harder on my point guards and expect more from them. I do not and will not tolerate bad attitudes just to win a game. Basketball will stop one day and a good attitude is necessary to function in life. So, I don't reward bad attitudes at a young age. My coaching staff reserves the right to suspend, remove or dismiss a player with an attitude problem that is detrimental to the team, its goals and objectives. In the past we have played mostly in tournaments sponsored by Mid-America Youth Basketball (MAYB). And let me just say this about the competition we've faced previously— it ain't no parks and recreation ball. It was some of the toughest competition around. In the beginning our teams took their lumps and got discouraged at losing, but I think the level of competition benefited them. The bottom line is our players are ready to play at the next level. Most have played at the middle school level and at least four have played on the high school level. Two constants that you will hear me stress during the course of the season are "THIS AIN'T NO PARKS AND RECREATION BALL," which although grammatically incorrect, speaks to the level of competition we will be facing. Perhaps this is a contradiction in philosophies, but nonetheless, I stand behind both of them. Winning is not my main focus, but I ALWAYS play to win. Playing time is earned in practice. I will give EVERY young lady an equal opportunity in practice to get better and learn the plays that we run. It takes listening, retention and transferring skills taught to EARN playing time. When the game is on the line in a close contest, I am ALWAYS going to go with the five players that give me the best chance to win. While we generally try to employ a player rotation during the first half to attempt to dole out an equal amount of playing time, during the second half I generally substitute as needed on a player-by-player basis. Sometimes this means that some players may get more playing time than others and parents get upset. For the most part, this has worked good for our program, however some parents have voiced concern about their child's playing time. If a player or her parents takes issue with her playing time, I am more than willing to listen to their concerns and to offer constructive criticism on what the player needs to do to improve. However it is the player's choice to strive to improve or for her parents to find another team if they are totally unhappy. Those who feel everyone should receive an equal amount of playing time should realize that MAYB is not a recreational league. Playing time is a privilege, not a right. The second cliché of mine is a challenge: "MAKE ME PLAY YOU." I strongly believe that you play like you practice and that playing time is earned in practice. My challenge to each player is to prove to me that you deserve the playing time I give you. Make it so I can't afford to take you out of the game. You don't have to be the most talented player on the floor, but if you give it your all in practice you are rewarded for it in games. Once again, I'm making aware our coaching philosophy up front so that there are no misunderstandings. My philosophy todatehas not been a problem. I do not anticipate it becoming one in the future, However, COMMUNICATION ELIMINATES CONFUSION. How a player looks back on their experience by playing for me is EXTREMELY important. I reiterate one of my golden rules: "Communication eliminates confusion." and I want to ensure there is no confusion where my coaches or I stand with our philosophy. For the most part we have had no problems, however few times questions have been raised. Every young lady that has EVER suited up for me I look at as a daughter. I love them all whether they finished on good terms, as the majority, or on not so good terms, the minority. I will always try to make sure that my players have proud and fond memories of their time spent on my team. However, I will never apologize for trying to run a first class organization. I coach for the love of the game and the kids. Not because I have to, but because I love to. I am proud of the growth of the Lady Deuces and all the wonderful support that I receive from all the parents. MAYB is a lot of fun. It prepares players to play at the next level. But even more importantly than preparing them to play at the next level, I take greater pride in assisting your efforts in preparing them for life. And basketball offers so many aspects of life. There are thrilling moments, unforgettable memories, painful setbacks and great comebacks. There are the adjustments that have to be made on the fly, to having to deal with so many different personalities in a positive manner; from learning how to win graciously to learning how to lose even more graciously. From how to handle success, and not giving up to how to compete for your position and keep it; from how to handle criticism to how to pick yourself up when things aren't going so great and be mentally tough. Another aspect of life we try to offer through basketball is fiscal responsibility. Traveling basketball is not cheap; it adds up over time. But it's worth it and is money well spent. I like for the girls to earn some — if not all — of the money they will need for the season. We will try to keep expenses to a minimum for the parents. The more we can stay out of your wallets the happier we are and I'm sure you will be as well. Subsequent fundraisers are used to provide scholarships to players with financial hardships and to pay for other expenses such as uniforms, equipment, training materials and a post-season party. My staff and I look forward to coaching your daughter. We think the additional playing and practice time will bode well with her skill development. In my view, not only is the object of the league is for them to have fun, but to also learn and improve on their skills. We thank you for entrusting her development — as a player and as a young lady — with us. * I will place the emotional and physical well being of my players ahead of any desire to win. * I will remember to treat each player as an individual, remembering the large spread of emotional and physical development for the same age group. * I will do my best to provide a safe playing situation for my players. * I promise to review and practice the necessary first-aid principles needed to treat injuries of my players. * I will do my best to organize practices that are fun and challenging for all my players. * I will lead, by example, in demonstrating fair play and sportsmanship to all my players. * I will insure that I am knowledgeable in the rules of each sport I coach and that I will teach these rules to my players. * I will use those coaching techniques appropriate for each of the skills that I teach. * I will remember that I am a youth coach, and that the game is for children, not adults.